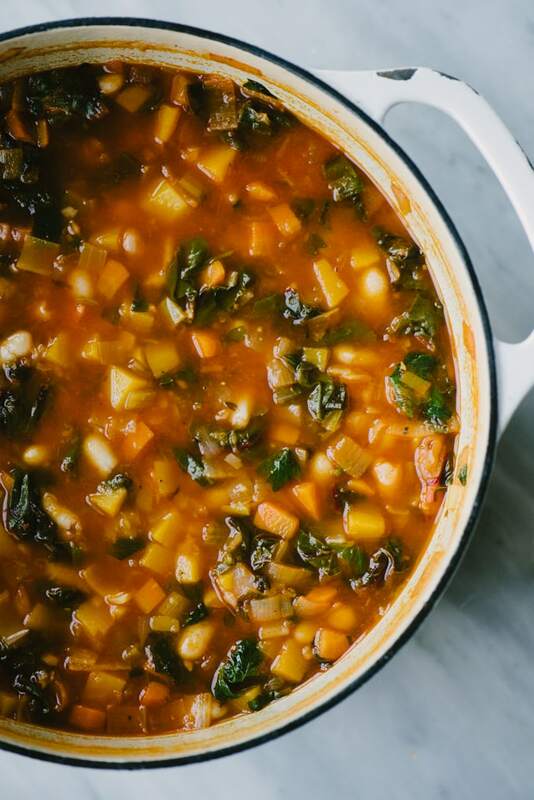 This winter minestrone is a hearty and deeply nutritious soup that’s perfect for these chilly days leading up to year-end holiday indulgence. It’s packed with colorful winter vegetables, but is still rich and satisfying. It’s naturally gluten free, vegetarian optional, and completely addictive. I dare you to eat just one bowl! Friends! I hope you all had a wonderful Thanksgiving day and long weekend. Ours was filled with family and giggles, turkey and trimmings, too much pie, and all of the cheese – Thanksgiving goals achieved. 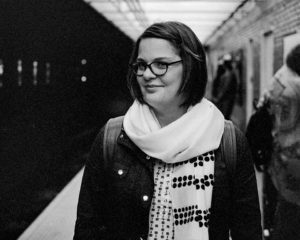 We’ve been back to the grind this week, and if you’re anything like me, you’re taking a three, maybe four, day breather before the onslaught of holiday food continues. Because what’s the point of detox January without an over-indulgent December? 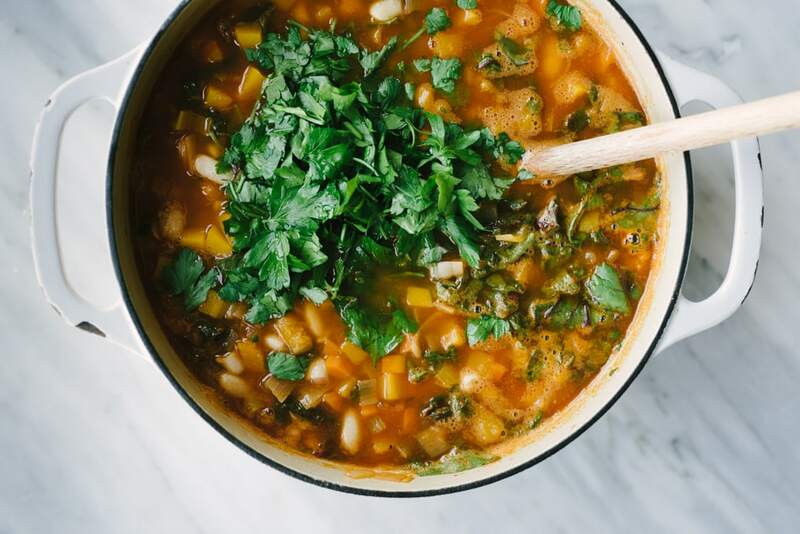 Luckily for you I came home to a fridge stuffed with CSA winter vegetables, so I made this winter minestrone to (virtually) share with all of you. And it’s freaking amazing. 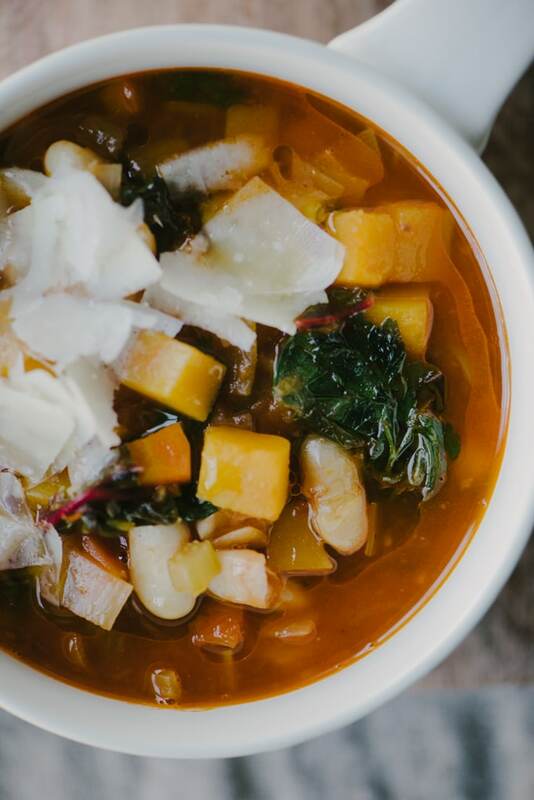 This gluten free minestrone soup is loaded with winter veggies like butternut squash, swiss chard, leeks and carrots. Despite being packed with a ton of healthy, nutrient dense vegetables, it feels super indulgent. I forgo any sort of pasta to keep it naturally gluten free, and I promise you won’t miss it. For the amount of vegetables stuffed into this recipe, it’s shockingly rich with bright flavors and a velvety smooth texture. My version isn’t vegetarian (I use chicken bone broth) but you won’t compromise too much flavor by using vegetable broth (especially if it’s homemade). This recipe is nutritious, colorful, easy to prepare, and supplies lots of leftovers to tuck into the freezer. Pin it now! 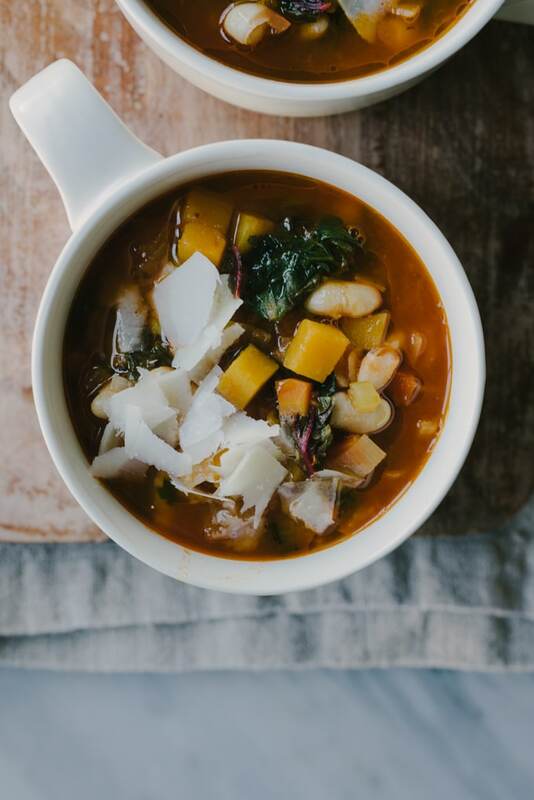 Click here to add this recipe for Gluten Free Winter Minestrone Soup to Pinterest! 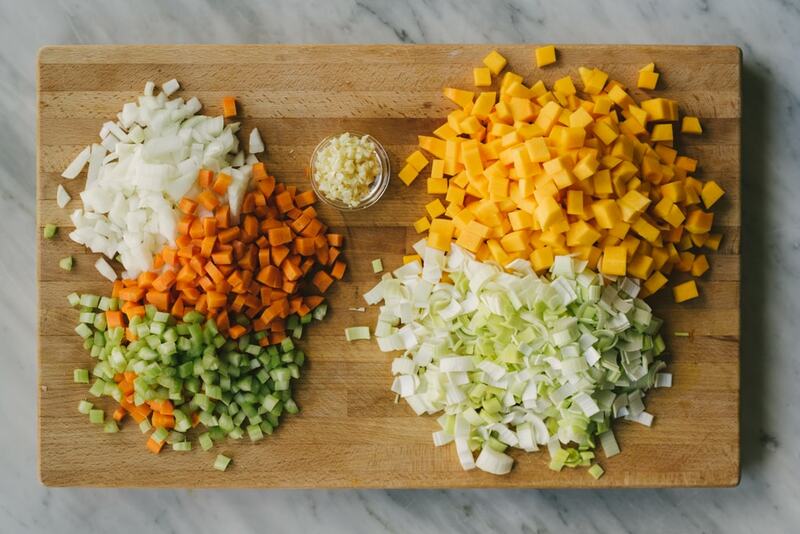 If (and that’s a big if) there’s a drawback to this recipe for winter minestrone, it’s that there’s a fair bit of chopping involved. I happen to really enjoy dicing vegetables so this doesn’t bother me a lick, but you’ve been warned. Keep the size of your diced vegetables uniform (I go for a half-inch dice) so that each bite is packed with as much variety as possible. 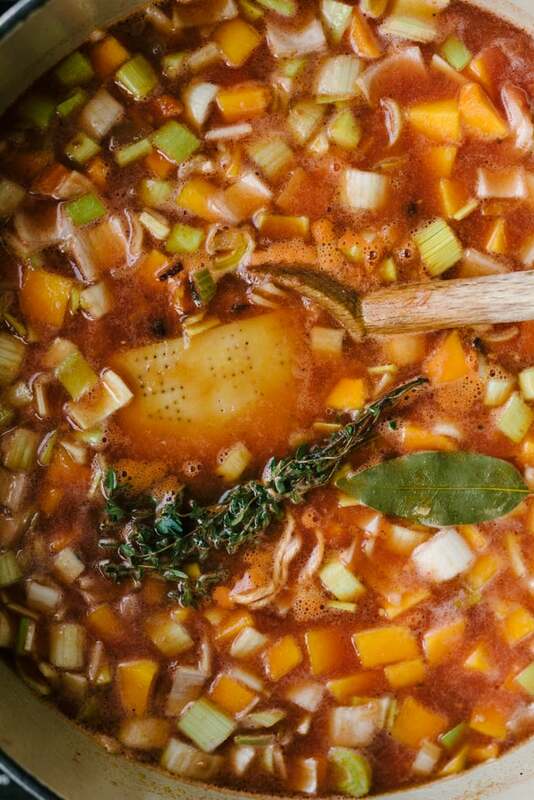 The magic in achieving a velvety, rich minestrone comes from adding a parmesan cheese rind. It will sort of melt and fall apart into the soup while it simmers, creating a creamy, thick texture. Plus it’s a great way to use up a “scrap” that you might otherwise discard. 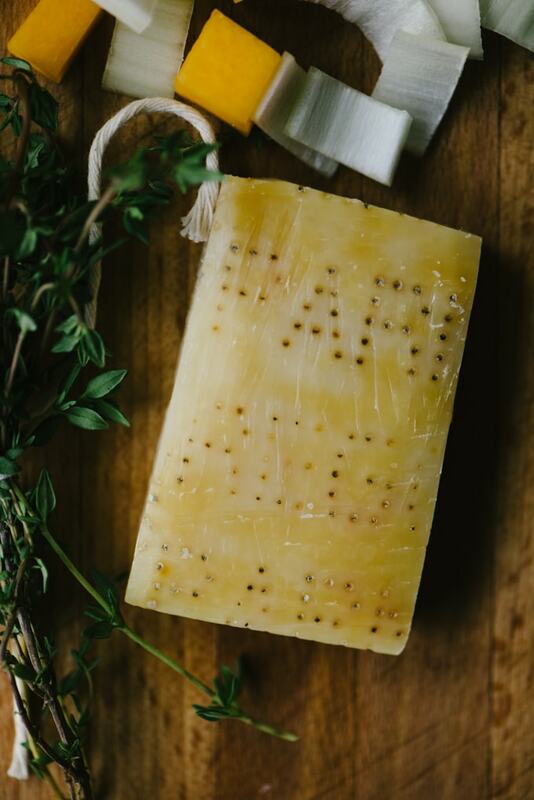 I keep my parmesan rinds in the freezer and pull one out when I know I’ll be making a minestrone; it defrosts on the counter in about an hour. 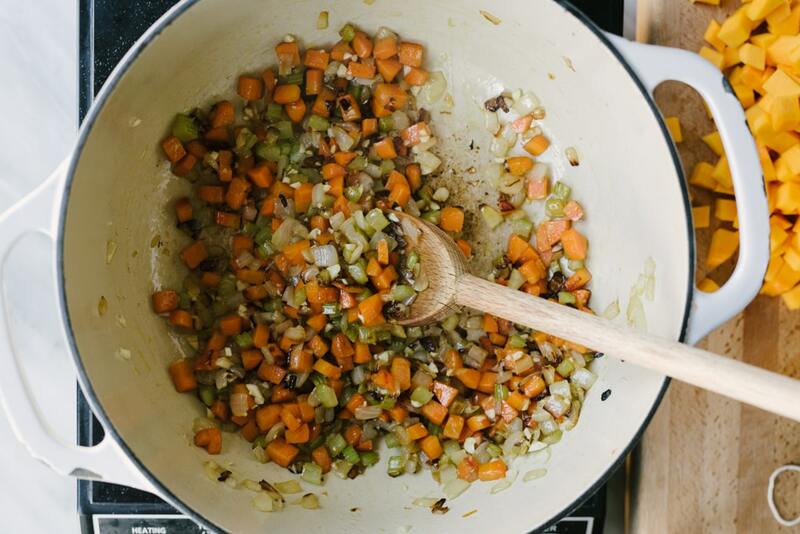 This recipe starts out simple enough with a basic mirepoix sautéed in butter until soft and barely browned. Then you’ll add the garlic, squash and leeks, a can of crushed tomatoes, some herbs, the parmesan rind, and broth. I use homemade chicken bone broth, both for flavor and texture. Feel free to substitute vegetable broth for a vegetarian version. Then give it a good, long simmer. Note that you’ll get increasingly hungry over the next 30 to 40 minutes because your kitchen is going to smell insanely fresh and tasty. Be strong, friends. 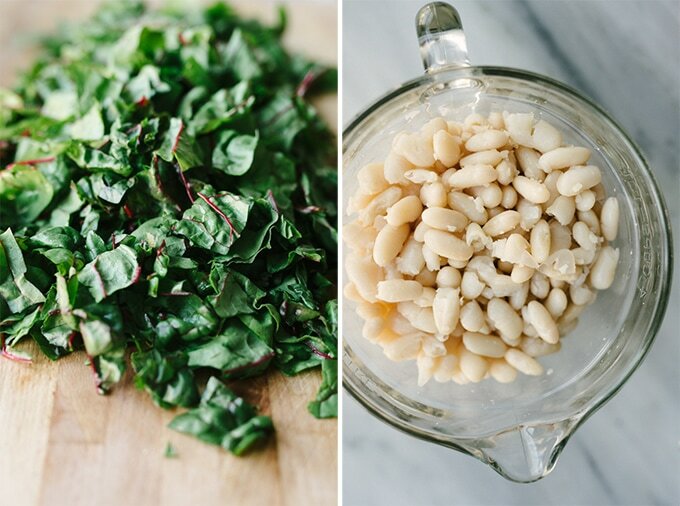 At the very end you’ll add the swiss chard and white beans, then a handful of fresh parsley, and a squeeze of lemon. Feel free to substitute kale or spinach for the swiss chard. If you’re substituting kale, cook it a bit longer (and extra 10 minutes should do the trick) since those tough fibers need a bit longer to break down; if you’re using spinach, just stir it in at the end with the parsley because it wilts really quickly in the heat. I prefer to use from-scratch beans because I find them creamier (get my tips for perfect from scratch beans here). Canned beans are totally fine, but you might want to cook them a bit longer (say 10 minutes instead of 5). Ladle the minestrone into bowls, drizzle with extra virgin olive oil, dust with some shaved parmesan and get your winter cozy on. This makes eight generous servings and freezes beautifully. 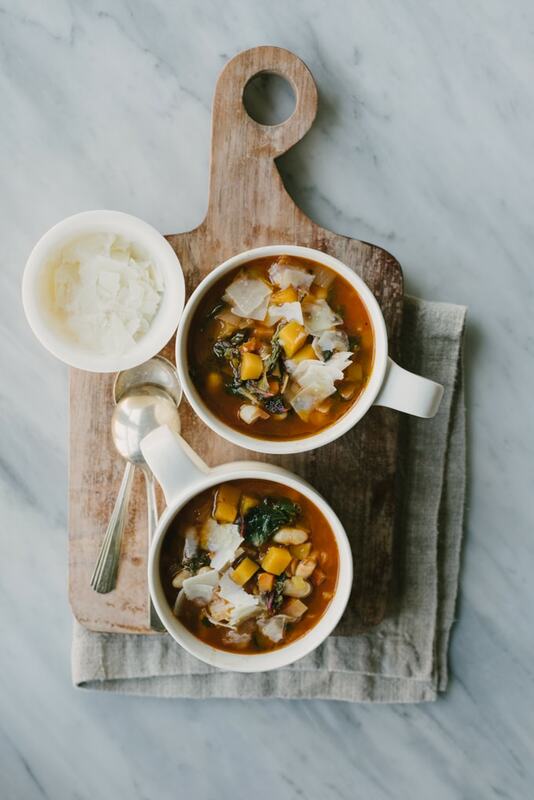 DID YOU TRY THIS RECIPE FOR WINTER MINESTRONE? I WANT TO SEE YOUR CREATIONS! CLICK HERE TO SHARE A PHOTO. 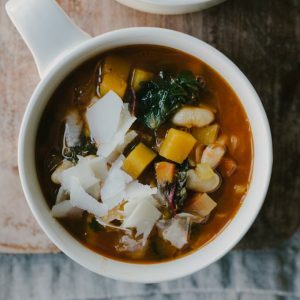 This gluten free winter minestrone soup is packed with healthy, nutritious vegetables but is still rich and indulgent. Perfect for chilly winter nights! 1 large vidalia onion diced to 1/2"
2 medium carrots peeled and diced to 1/2"
2 stalks celery trimmed and diced to 1/2"
1 small butternut squash (about 2 lb) peeled, seeded, and diced to 1/2"
Heat a dutch oven over medium heat. Add the butter and heat until it foams. Add onions, carrots and celery and saute, stirring occasionally, until soft, 7-8 minutes. Add the garlic and saute, stirring continuously, until the garlic is fragrant, about 1 minute. 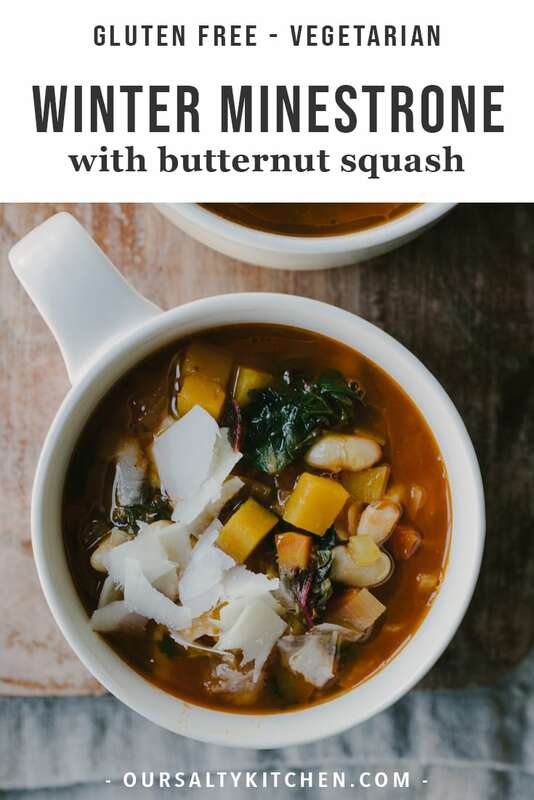 Add the butternut squash, leeks, tomatoes, bay leaf, fresh thyme, salt, pepper, parmesan cheese rind, and broth to the pot and give everything a good stir. Increase the heat to high and bring to a boil. Reduce to low, cover, and simmer until the squash is tender, 35-40 minutes. While the soup is simmering, prepare the swiss chard and parsley. Add the swiss chard and white beans to the pot, stir, and simmer until the chard is tender, 5-7 minutes. Taste for seasoning and add additional salt and pepper if needed. Fish out the bay leaf and fresh herb stems. Remove from heat and stir in the lemon juice and parsley. Ladle into bowls, drizzle with about a teaspoon of olive oil, then sprinkle with parmesan cheese. Serve immediately. This keeps in the fridge for up to a week, or in an air tight container in the freezer for up to 3 months.